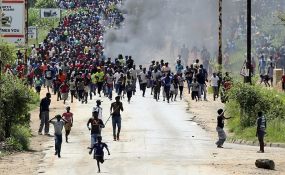 Angry Citizens in Zimbabwe shutdown protests. Five journalists were caught up in demonstrations that rocked Harare and Bulawayo on Monday 14 January 2019. In Bulawayo, three journalists working with Centre for Innovation and Technology (CITE) were affected. Zenzele Ndebele reports that a police officer in the back of a moving vehicle pointed a gun at him when he was in the process of covering riots in Bulawayo's Nkulumane suburb. Abigirl Khupe and Lulu Brenda Harris both with the same organisation were teargassed as they covered protests in different parts of Bulawayo's business district. Khupe was covering protesters as they moved from City Hall. Harris was reporting on protests that broke outside the Bulawayo High Court where Chief Justice Malaba officiated over the opening of the 2019 Legal Year. In Harare, a crowd of protesters who were demonstrating near 4th Street bus terminus, harassed John Cassim, a foreign correspondent. The protesters were involved in running battles with the police. MISA Zimbabwe also received a report from Bulawayo based Lucky Tshuma who reported that police detained Mqondisi Nzipho, a freelance journalist. According to Tshuma, Nzipho was covering events in the city when he was arrested and put into a police vehicle marked "Bulawayo Central." Tshuma states that at the time of his arrest, Nzipho was displaying his media accreditation information. MISA Zimbabwe calls upon the citizens and the authorities to desist from attacking or interfering with media when they are carrying out their constitutionally guaranteed duties. Journalists are encouraged to put on their media practitioners bibs and display their accreditation cards when covering riotous events. Media practitioners are advised to utilise the MISA JournoSOS App as well as the MISA Panic Button App in the event of any violations. MISA Zimbabwe staff is also on standby to assist media practitioners injured or arrested in the line of duty. The MISA Hotline is 0784 437 338.